Polar bears have become the universal symbol of global warming, not so much because they’re cute or cuddly , but because it is eminently clear that climate change is killing them. 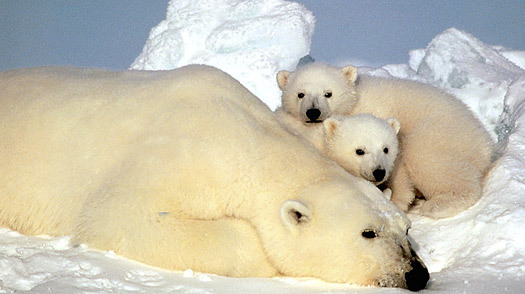 Polar bears depend on solid sea ice for survival; it’s where they do their hunting. But when the ice begins to melt  as it has in recent years, thanks largely to warming  the bears can starve and die. A 2007 study by the U.S. Geological Survey found that two-thirds of the polar bears on the planet could disappear by mid-century if Arctic ice keeps melting. So when the Bush Administration bowed to pressure from environmental groups last year and finally listed the polar bear as threatened under the Endangered Species Act  admitting that melting sea ice was the reason  it was considered a rare green coup. Since the ESA mandates the government protect endangered species from hazards, listing the polar bear as threatened by global warming would appear to require Washington to control carbon emissions. Some green groups even thought the ESA could be used to fight new coal plants and other big emitters of greenhouse gases, on the grounds that they would accelerate warming and harm the polar bear. But there was a catch. While declaring the polar bear threatened by global warming, the Bush Interior Department added a rule that limited the use of the ESA to curb greenhouse gas emissions. In other words, even though science says that global warming is directly hurting polar bears and man-made carbon emissions are the chief cause of global warming, Washington wouldn’t be allowed to use the ESA to do anything about it. It’s a little early to judge Salazar’s tenure at the Interior Department, and the Secretary may have a point  the ESA wasn’t designed to counter a threat as global as global warming. The best way to deal with carbon emissions is to pass national legislation that would create a cap-and-trade program, rather than trying to stretch the ESA to fit a purpose its drafters couldn’t have foreseen. But the ongoing battle over the polar bear is a reminder that wildlife will be the first victims of global warming  and that saving them won’t be easy.